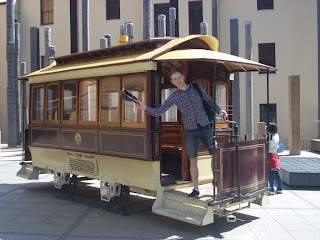 Given Craig's recent excellent post about the Sydney Metro, wherein he discusses the city's need for some decent light rail, we decided to visit the Museum of Sydney. We haven't been yet, and they've got an exhibition all about Sydney's past glory: the Sydney tram system. The museum is in a beautiful building, with cool signage, and it's built on the site of the First Government House of Sydney. 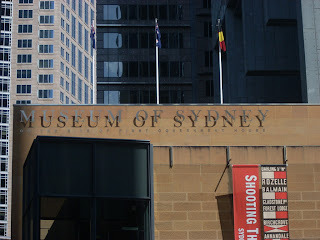 In fact, excavations have been done under the museum, and under sections of glass floor, Sydney's earliest surviving hand-hewn sandstone bricks, charcoal from a fire burnt centuries ago, broken dishes, early drains. The museum, like every museum I've seen in Australia thus far, is excellent. They have a cool panoramic photograph of Sydney, sort of before and after. You can see how boring harbour looked before the Harbour Bridge, before the Opera House. They have an excellent little room dedicated to the conflict between MacArthur (a filthy scoundrel of a capitalist who wanted to make money his way and wasn't about to let any rule of law and order get in his way) and Bligh (a government man who wanted to create some freaking law and order to keep scoundrels like MacArthur from using prisoners as his personal slave labour-force). 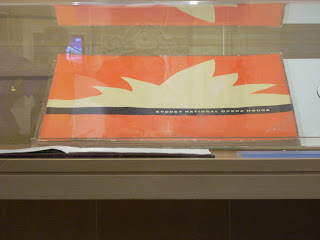 The Museum also has Jorn Utzon's Opera House proposal on display. From the front cover, you can see that Utzon already knew this building would be an icon; it's prophetic and amazing and eerie. An exhibit about Glenn Murcutt's architecture had one of the coolest museum devices I've ever seen. 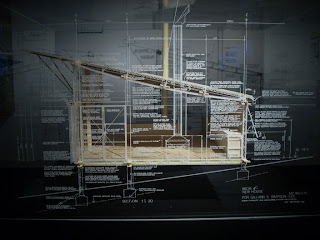 The model is inside a glass box, and all of Murcutt's architectural drawing/notes, etc. 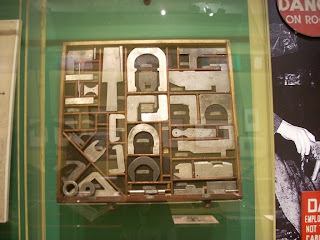 are printed on the glass. 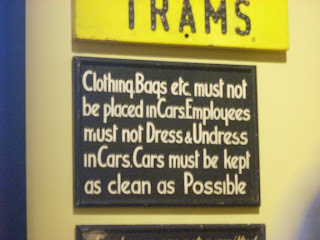 Later in the exhibit, we learned that Craig was really not wearing the appropriate tram driver uniform. 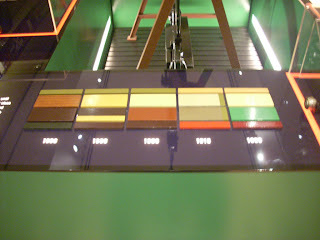 A board showed the appropriate colours for all the trams during different periods. And he wouldn't be allowed to just undress anywhere he wanted, which in Craig's book, is a dealbreaker for any job. And, he'd have a speed limit. 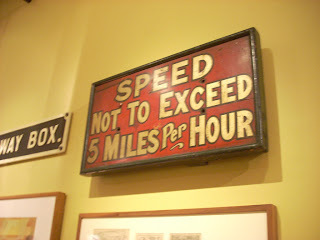 Now, we all know Craig zips faster than that on his bicycle, no electric power needed. I'm beginning to think tram-driving just isn't the right career for him. A beautiful display of a tram mechanic's toolboard. I love how every slot is perfectly shaped to hold one specific tool. Someone sat down and figured out how to make all these bits fit into a square. It's lovely. Sydney once had the second-largest tram system in the British empire, second only to London. From the 1940s to the 1960s, the trams died a slow death, victims of their own success and competition from the private car industry. Interestingly, MARTA is dying a similarly slow death, but, um, certainly not due to its success. At their peak, the Sydney trams were carrying a million people a day. By the end, there was a lot of bad PR about the trams; they were considered dangerous and loud; people thought they congested the city, though no one foresaw the hell of single-passenger traffic. On the last trip of a tramroute, people would walk behind the tram, filling the tracks with tar, to ensure the trams could never come back. These days that tar is wearing a bit thin, and you can see the old tracks peeking through the asphalt on the roads. 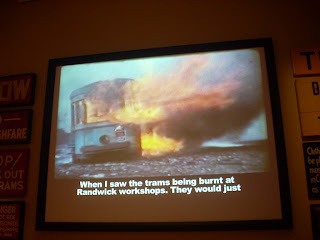 And once the trams were finished, they were inexplicably burned. A few remain, a few were sold to private collectors, but the vast majority were burned to the ground. Melbourne never got rid of its tram lines and they are clearly better than Sydney's noisy, smelly, always-late, always-busy, always-not-in-service bus system. Melbourne's trams are cheaper, faster, but they're not perfect. There aren't any dedicated tram lanes, so the trams often get stuck behind cars in traffic. Some people are working very hard to bring light rail back to Sydney, but to me, it feels like such a big idea, I can't see when or how it will ever happen. Then again, I have very bad vision; I'm extremely near-sighted. I blame my parents for my bad eyes; I hear when you get older, though, your eyes change and you become far-sighted. Maybe by then, Sydney will have solved this problem, and I'll be able to see solutions for everything else this city has to face. 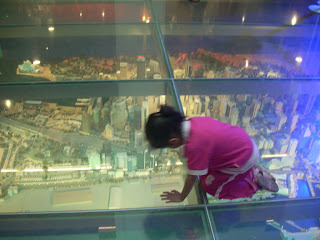 After the museum, we stopped in to the old Customs House, and found a delightful miniature model of Sydney built under –wait for it– another glass floor! What's with that? It made me wish we'd taken the family when they were here. Watching this little chicken scootch around pointing out random bits to her family, I felt a little homesick for my favourite scootchers. 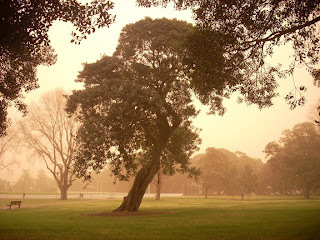 I woke up this morning to an odd orange glow outside the window; a glance outside revealed a hazy, foggy morning unlike any I'd seen in Sydney so far. But after the monster downpour that left Nija and me soaked to the bone last night, I figured anything was possible this morning; maybe it was a thick fog that turned the sunrise into an eerie, ruddy glow. By 7:30, though, I noticed that while the world was a little brighter, it was still as orange as can be. Something strange was afoot. It crossed my mind that this could be ash from bushfires, but I didn't smell anything burning and it was doubtful that some new bushfire had cropped up after that pounding we got last night. When I got out to my bike, it was coated with a thin layer of orange dust, like the pollen I'm accustomed to in Atlanta springtime. But this was no pollen. 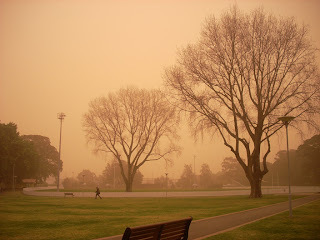 A quick glance at the news on my phone proved what I had started to suspect: last night's storm blew a huge cloud of dust from the deserts of western NSW and South Australia into the city. The Sydney Morning Herald has some amazing photos and is reporting that the dust and winds have shut down the M5 East tunnel and ferry traffic across the harbour, and flights at the airport have been delayed. Some callers to ABC radio reported finding dead baby birds in their backyards and even cats having gone missing. The dust has now pushed Sydney to one of Twitter's top 10 topics (whatever that means) and the radio stations, TV networks, newspapers and so on have all been beset by a barrage of calls and emails. The Bureau of Meteorology is calling this the worst dust storm ever to hit the city and the Air Quality Index has been raised to red (Hazardous). What's clear is that people can't help but feel a little twinge of apocalyptic anxiety, even if they know exactly what's going on. When untrained observers can't tell if the thing they're looking at is the sun or the moon, it's unsettling. On my trip in to school I saw a woman standing on her front stoop, looking at the sky and singing to it. Most people weren't that unhinged, but there's something about that look that people get in a big city when an all-pervasive, surprising event like this occurs: it's almost as though people are debating whether to take it as a sign of something bigger, even though everyone just wants to act as though they wake up every day with everything covered in red dust. As a newcomer to this strange and ancient place, the colour of the world this morning had me thinking of the massive expanse of redness that lies just to the west, which I have yet to see for myself but that always lurks around the corner of urban Australia's subconscious. Perhaps the desert might eventually swallow this place. For now, though, it's just come for a visit. When Craig got up to leave this morning, the room was pinker than usual, but I was too tired to ask why. He calls a few minutes later, and tells me to look outside; I go to our balcony. 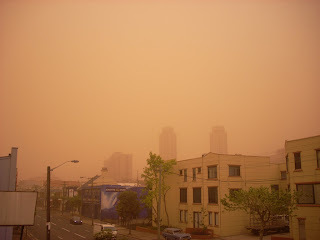 The Redfern Towers are obscured by an (un)earthly red haze. I've never lived through a dust storm before. I thought I'd never lived in a city where dust storms are possible. Sleepy, still wearing my glasses, I go out to the park behind our house. 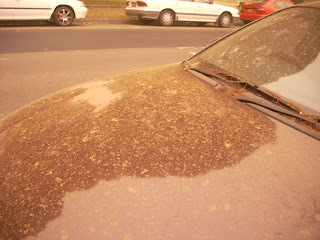 A thin film of red dust covered the cars, even the trees were overlaid with an ominous orange smog. The colour is that of Australian landscape photography, of the red rocks that hold the spirit of the world for a native and ancient people. It's a magical colour. A green and blue city that (occasionally) turns red and orange, and just for a while, smells of clean dirt rather than mold and exhaust. This morning was a beautiful respite from ordinary Sydney. This morning, we lived in a magical place. While we were having a record-breaking dust storm here, Atlanta has been harrowed by rain for over a week. Historical records were broken back home, too, as 12 inches of rain stormed down in one day. The city is flooding. Jeremy was the first to tell us about it; looking at pictures, I'm horrified. From these pictures, Atlanta looks like New Orleans, post-Katrina, in the terrifying, sobbing, breath-held weeks before the water finally withdrew, revealing the havoc it had left behind. Craig and I went to New Orleans to help clean up a few months after the storm, and the devastation was still awful. I don't know how Atlanta will manage this, with recession making everything harder anyway. I can't believe mere rain could cause flooding like this, I can't believe Atlanta can rain like this. Lynn, Craig's NOLAgirl mom, told me she'd expected this from New Orleans, with the hurricanes and storms. I told my dad about our dust storm here, and he said, "Nijaben, the weather's changing." This morning sort of feels like a bewildering reversal: the desert came to rainy Sydney, and the ocean came to dry Atlanta. The weather is changing. All the way from Atlanta to Sydney, the signs are everywhere. What I found really brilliant about this analysis was how Greer clarifies the role that wives of public men are written into by "experts." She examines how the wives of men who are successful and well-liked are often painted as conniving and unloving. Think Hilary. The wives of the men we admire can never be worth sharing their beds. When Bill was in office, Hilary was painted as a careering woman; their marriage is regularly presented as the picture of marital strife. But she stayed with him and stood by him through an impeachment over an incident wherein Bill humiliated and betrayed her. Politically, I'm no Hilary fan; I think she's as snakey and weasely as any politician. But the judgement of her behaviour as the wife of another weaselly politician plainly shows how successful men are simply held to a different and lower standard. Oh my god, I cannot believe I have a copy of this book. Sure, it's a photocopy. It's still worth its wait in gold. Update: I've just finished this book! If the story behind it weren't so intriguing, I never would have read it, but I'm glad I did, because it is a fabulously bad book. It's so sincerely bad, reading it was hard. At a mere 130 pages, I should have finished it in a matter of days, but the prose is so indulgent and...let's face it, bizarre, it took me longer than it should have. Preston is an odd teenager, mostly because of how much he, his sister, and his friends "amble" around. He gets seduced by his teacher, gets sexually threatened by the "warder" at the juvenile detention centre. In fact, no one can leave Preston alone; even his best friend can't help himself around Preston. It's hard times, because all Preston wants is some damn Pepsi-cola and his ex-girlfriend back, but she's planning to move away. Life's full of bad luck, and it's enough to make a guy want to drink 3 Pepsi-Colas. Against the odds, but a touch too late, Preston manages to get the girl back. It's tragedy. Gibbons grew up in cold grey Wales, but the book is all about Malibu. It's clear that June had an excellent grasp of Malibu's climate: the sun is several times described, aptly, as a "fireball in the sky." It's so literal! "Preston thought; life is a confusement." When he's at the juvenile detention centre, Preston's mother visits him. She asks him how he's doing, and he says, "It's pretty noisy.....the place is like a prison camp." Excellent observational skills. It's not a great book, but it's not famous for being a great book either. It doesn't have the star appeal or even the "written from behind asylum walls" intrigue of Save Me the Waltz. But it's an extremely rare piece of cultural history, an important door to one of the strangest stories of sisterhood the world has ever known. I'm proud to have read it. I would implore our readership from Atlanta to have a look at this ad, which I noticed in print form this morning while riding the bus and reading Central Magazine. It's publicising the new Sydney Metro project, which will be an urban metro line running from central Sydney to some of the inner western suburbs. Is it just me, or did some graphic design intern REALLY not do her research? If the state government knew anything about the particular metro system shown in those photos, they would've screeched away from the MARTA website quick-smart and never looked back, lest they be smoten and transfigured into pillars of Vegemite! Let's just hope that this isn't an omen of doom for the Sydney Metro, because we could really use a proper metro system in this town, not some rinky-dink operation that makes people want to get out the rocket launcher. For those who aren't familiar with the Metropolitan Atlanta Rapid Transit Authority (MARTA), it's one of the most maligned public transit systems in the US. MARTA runs buses and trains throughout DeKalb and Fulton, two of Atlanta's core counties, and also operates the bus systems of some of the adjoining counties. MARTA's train system consists of two lines: a north-south and an east-west line. As the country's largest public transit system that receives no state-level funding, MARTA suffers constant funding shortfalls that hamstring any proposals to expand the service, especially the rail service, beyond its current limited scope. MARTA's history is a troubled one coloured by racism and an anti-working-class attitude toward cities and public transit. The MARTA project was initiated in the late 70s and was forseen as a system that would link transit throughout the multiple counties that comprise Atlanta, but coming as it did at the height of the white exodus from the cities into outlying suburbs, the eventual system only served the two "inner city" counties. The others flatly refused to have train lines extended to their enclaves, depicting such a system as a convenient method for inner-city thieves and rapists to find their way out to the white suburbs to loot and pillage, as though loading up a bunch of stolen TVs onto a metro train is easy and discreet. The state, for its part, has historically preferred to spend its transport funds on highway systems, and the non-funding of MARTA goes in hand with a rejection of Atlanta in general from the state level, a theme after the 1960s and something familiar if you live in NSW. As the state sees it, MARTA is a two-bit system that only serves the poor and will never recoup its outlay. Indeed 78% of MARTA's ridership is black and on the low end of the socioeconomic scale, but Atlanta is a majority black and poor city, so any public transit system in Atlanta will have this demographic. For some, this is enough to put on the blinders. Ignoring MARTA has made for a difficult and often unreliable system with no flexibility. Train stations are placed in non-intuitive and inaccessible locations. Buses run infrequently, if at all. New stations in the city are not forthcoming, and station upgrades are slow. Much of the system's rail stock is obsolete stock from the 70s; new parts can't be ordered and instead must be fashioned by the toolmakers at the MARTA workshops. Stations are understaffed and fares are easily cheated when the one station agent is looking the other way. Not once, not twice, but three times I was on the east line during a downpour which shut down train travel entirely when the driver realised the brakes had stopped working. Every MARTA rider is also familiar with the open door of death: your train arrives at a station and opens its doors to let in new passengers, and when the doors go to close, one door refuses to do so. The driver opens and closes the doors about seven times to realise that this one door simply won't comply. The train can't move with an open door. Everybody off. It's not that riding MARTA is always unpleasant; sometimes it's a wonderful feeling to be riding high above the traffic, overhearing the conversations of the other riders. And you can still bring bikes on the trains for free, something a more popular system wouldn't allow. But there's always a twinge of peril in a MARTA trip: you know that this could be the last one, that the perpetual financial crisis could eventually just shut the thing down entirely, that the tracks might crumble, that the bus route might get cancelled. You know that a better, more extensive system would change the face of the city entirely, make it a greener, more pleasant place to live, easier to get around, more welcoming to the immigrant communities strewn far and wide in this rapidly-growing place. You know that a modern city deserves a respectable transit system, but this just falls too short. It's like the entirety of Atlanta--the racism, the poverty, the facade of success, the dangerous hubris--is wrapped up in the story of this pathetic little rump of a system. Sydney also deserves better than this. Sydney's transit is already better than Atlanta's by far, but it doesn't serve people in the city like it should. The lines of the huge Sydney tram system were ripped up, tarred over, and the tramcars burned in an act of terrorism in 1961 when the NSW government was pushed by the auto industry to help it sell buses and cars, and ever since it seems Sydneysiders have been poorly-served by their transit system. The new Metro project has already faltered horribly--attempting to tear down heritage sites in Pyrmont against the wishes of local residents and thus attracting a CFMEU Green Ban. I know it's only symbolic--and only to a select few--that this Sydney Metro ad would use an image of MARTA, but it just stirs up in my mind the complexities that factor into the construction of a transit system. I certainly hope that conditions are more favorable here to the building of something useful and integrated into city life than they were back home 35 years ago. I'm heartbroken. I've just learned Wait, Wait, Don't Tell Me!, one of my favourite favourite favouritest radio programs is finally visiting Atlanta this December! It would have been a perfect holiday celebration; seeing Peter Sagal, Carl Kasell, maybe even Adam Felber and Mo Rocca. I can't believe I won't be there. But you should go-- they're doing a nationwide fall tour. I'm trying to do more for Final Draft lately; hopefully you'll see my name on the producers line more often. Anyway, my interview with writer Alex Wheatle about his book The Dirty South aired on Final Draft last week-- you can access the podcast here. Craig recently got me a copy of The Pepsi Cola Addict, a seriously rare book that has quite the interesting history behind it. I'm very excited to read it. What I've gotten through so far is more OTT than Save Me the Waltz which Zelda wrote from the sanatorium. Do you want to hear something strange? In Australia, the supermarket brand of healthy, all-natural packaged foods is Sanitarium. I know they're not the same word, but really it seems like bad branding anyway. A few weeks ago, we finally saw Coraline. I think it was released about 15 years ago in the States, but you know...it takes a long time for movies to get over here. I mean, they have to translate it from American into Australian and dub it using union actors and mail each individual reel over here separately by carrier pigeon, and of course, half the pigeons aren't bred for that kind of strength these days. It's understandable. Anyway, I didn't realise until we bought the tickets, the damn movie is in 3D. Argh. We got out of the movie theatre two hours later, and someone had squished my eyeballs like grapes. I thought it was fantastic, but I look forward to watching it on my normal television. Without special glasses. And after hearing Linnell's song for Coraline, I want the soundtrack. Any of y'all seen it? 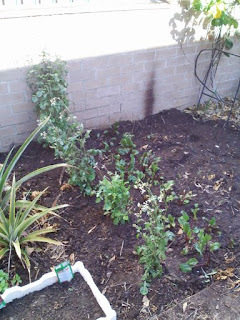 But after loads of hard work, it's tidy and pretty and dark and attractive. He's also gone seed-crazy. I've been busy, too. See, last month, lemonade season started. Those of you reading this in the US, you have no idea. This is a citrus fruit that tastes like a lemon, but it's sweet enough to eat like an orange. They're big and round, not ovoid, and they taste remarkably like lemonade. Which makes the name seem rather obvious, but lots of fruits have unimaginative names. Like oranges. Lots of people love oranges. Don't judge a fruit by its boring name. Anyway, lemonade season started, and it is super short. I didn't get enough lemonades last year, I don't think I could get enough lemonades in my whole life, and I wanted to get as many lemonades as I could this year. So I bought 16 kilos. 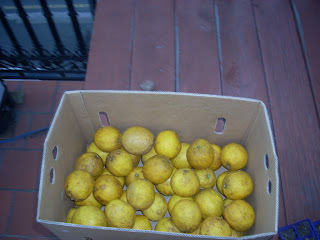 Seriously, I bought a bulk box of lemonades, and for the last two weeks, I've been eating lemonades almost non-stop. I've still got half the box left. Get over here soon and help me eat these delicious suckers. And check out our new neat neighbourhood. 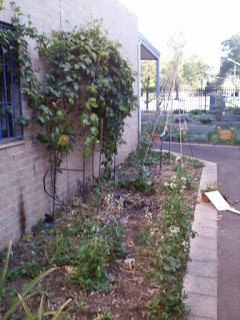 We're a 5-minute walk from Erskineville (lovingly called Erko by berserko locals), and it's a lovely walk. 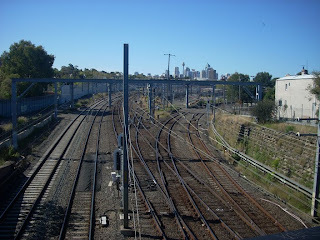 There's a bridge going over railway tracks, and you can see the Sydney skyline past the tangled tracks and winding wires cross-hatching the foreground. 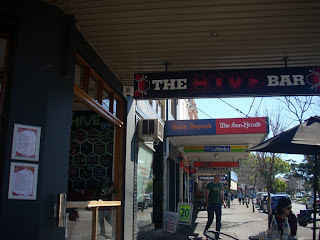 Not only does Erko have a beautiful view, it's also home to the best new bar in the city: The Hive. 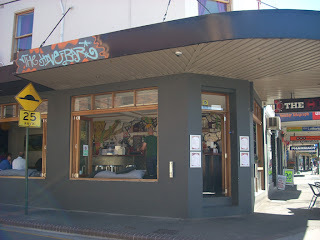 Check out how cute it is, a killer cornershop with booze, espresso and wasabi peas. They've got great microbrews and good pizza; you can even borrow playing cards, boardgames and UNO. UNO! Nanki-- I beat Craig Masa like 12 times today. Doink!